As DetroitDvotion nears its 4th anniversary, Kris and I thought it would be fun to go back to one of the places we wrote about in the beginning. 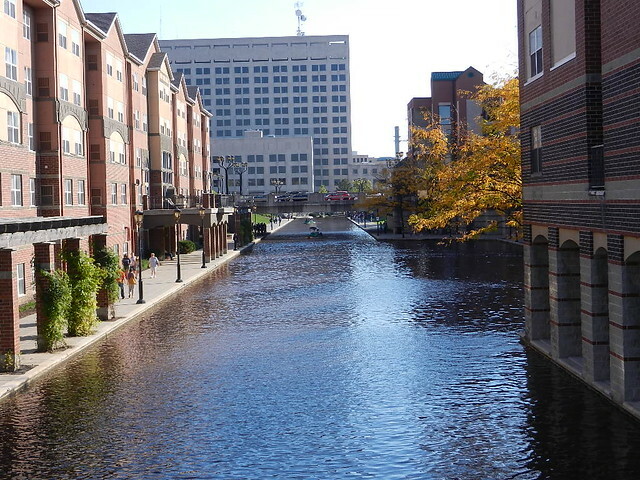 Today we are revisiting Ypsilanti, just 35 miles west of Detroit, 6 miles east of Ann Arbor, it’s a short drive and always makes for an interesting day. 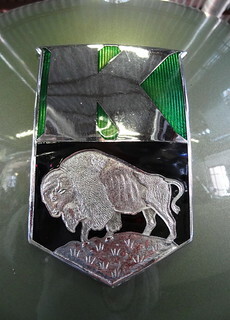 Ypsi is probably best known as the home of Eastern Michigan University, here are a few other notable facts: The B-24 Bomber Plant was located here at Willow Run, later, that same plant produced Kaiser Frazer automobiles, followed by production of a number of GM vehicles and their Hydramatic Division. In 1960 Tom Monaghan founded Domino’s Pizza as DomiNicks Pizza at 507 W Cross St. 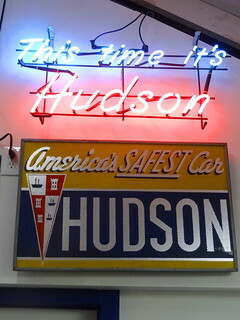 In 1929 Miller Motors Hudson opens, it is now the last remaining Hudson Dealership in the world and our first stop in town. 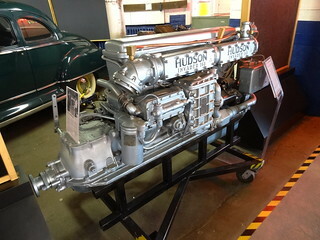 What used to be Miller Motors is now the National Hudson Motor Car Company Museum located within the Ypsilanti Automotive Heritage Museum; automobiles from each of Hudson’s five decades are on display. 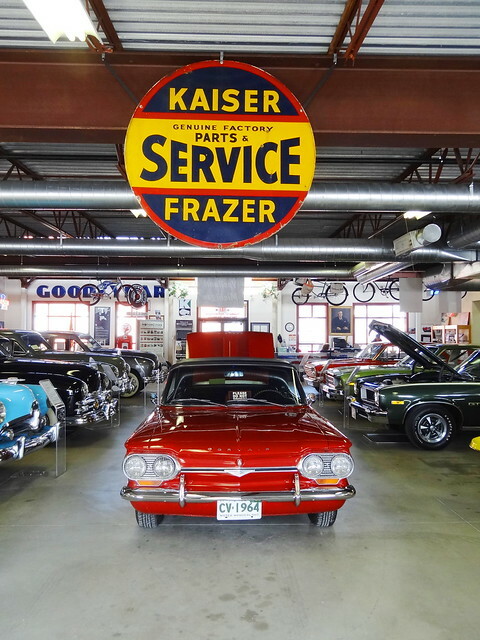 The museum tells the stories of Kaiser Frazer, Tucker, Hudson and General Motors Willow Run. 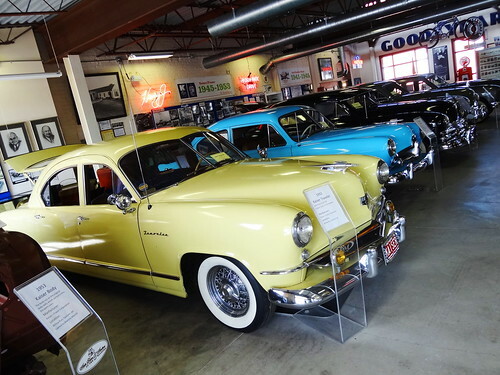 You need not know anything about cars to enjoy this museum, between the beautiful automobiles, attractive displays and great stories, you’re sure to be entertained. 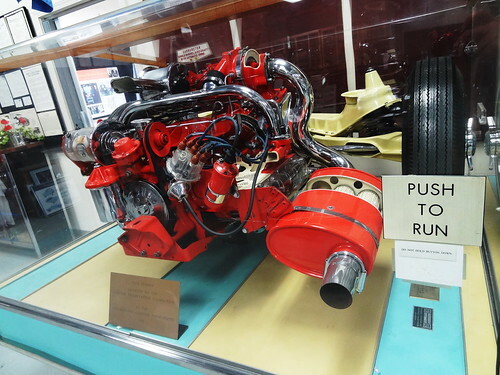 Vintage signs hang from the ceiling, photos and drawings line the walls, engines and transmissions are on display, showcases are packed with memorabilia; the vehicles themselves are the star attractions. 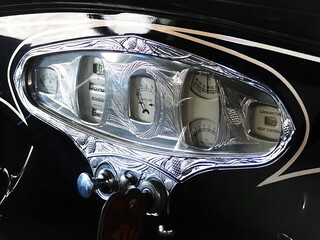 Hood ornaments are serious attention-getters, dashboards are gussied up with chrome details, Kaiser models look ready for a roadtrip, the cargo area is varnished wood. 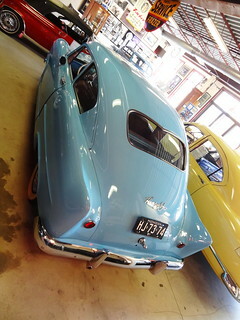 A pale blue 1952 Hudson Hornet #92 is a visitor favorite; a NASCAR champion driven by Herb Thomas, his story is the inspiration for the 2006 Pixar film “Cars”. 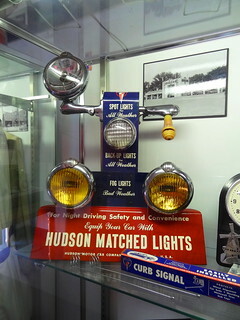 Hudson Hornets won 27 out of 34 NASCAR Stock Car races. We move through the decades from open carriage vehicles right through the 1970’s with a cool green 1974 GTO. 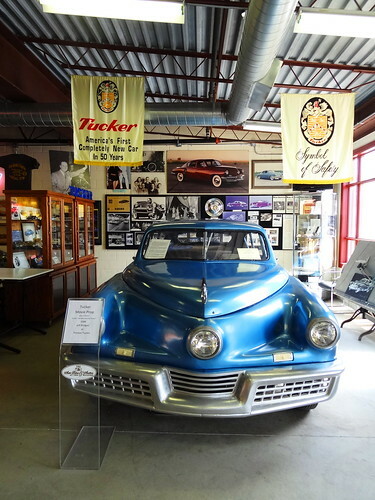 One area features the Tucker story, Preston Tucker lived about 4 blocks from the museum, the home has been restored and you can drive by it and take photos. 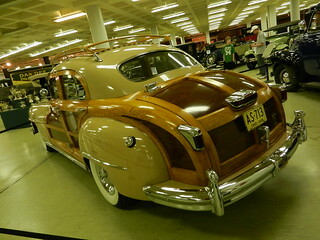 The 1946 Tucker touted safety features such as a rear engine, center headlight and pop-out windshield. There are great photos of the family and props from the movie Tucker: The Man and His Dream. 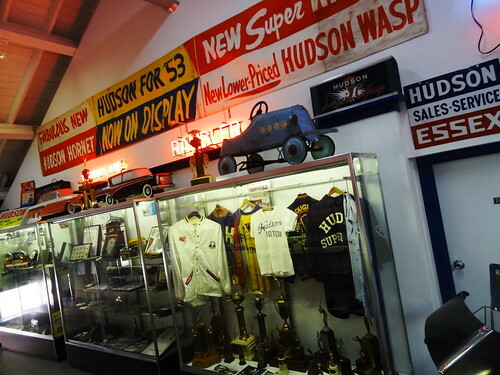 Up in the loft area we see a personal view of Ypsi; a showcase is filled with jackets, jerseys and trophies won by local sports teams sponsored by Hudson dealerships. 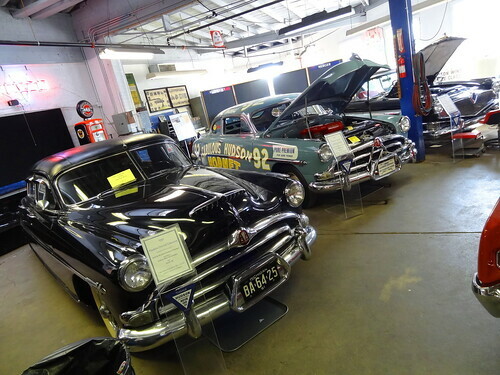 Mechanic’s overalls, plaques, scale cars are all nestled into the small space. 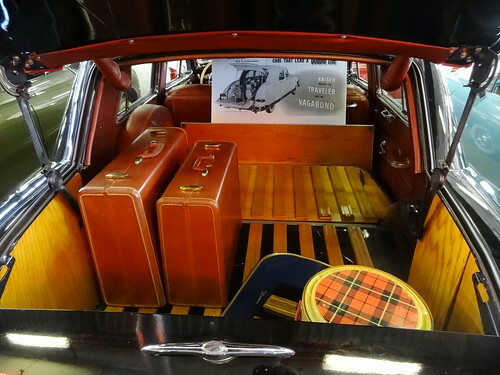 We overlook the main floor, a banner announces the new Terraplane, once popular names such as Rambler, Nash and Essex are recalled. 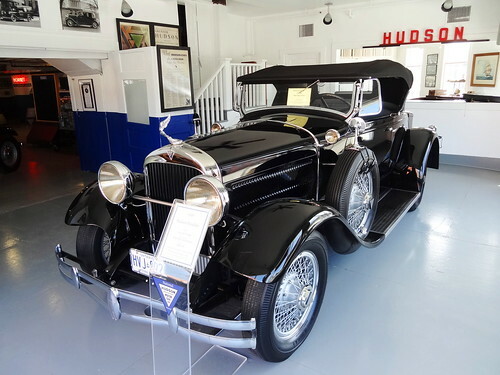 back downstairs, there’s a sleek black Essex Terraplane 6, the 1929 Hudson Roadster in the Showroom is stunning. Throughout the space old gas pumps, neon signs and banners add to the atmosphere, a white 1954 Kaiser Darrin and a red Corvair are parked lengthwise against a row of Kaisers. Hydramatic transmissions fill the front room, operations were moved to the Willow Run plant after fire destroyed GM’s Detroit Transmission Plant in Livonia. 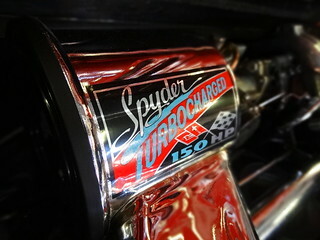 Hydramatic manufactured automatic transmissions for 11 automobile companies outside GM’s own divisions, including Rolls Royce. In 57 years, 82 million automatic transmissions were built there. During the Viet Nam War M16 Rifles and aircraft cannons were also manufactured at that site. 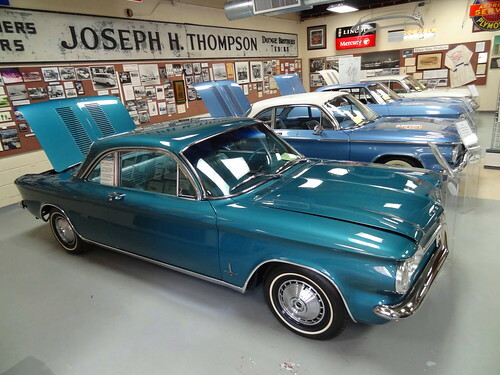 Willow Run Assembly produced the Corvair from 1959-69, it also manufactured Nova, Ventura, Omega, the 1974 GTO and other models for Pontiac, Buick, Oldsmobile and Chevrolet, I told you there was some amazing history here! On a sad note, after GM’s restructuring, the plant closed in 2010…..Ugh. 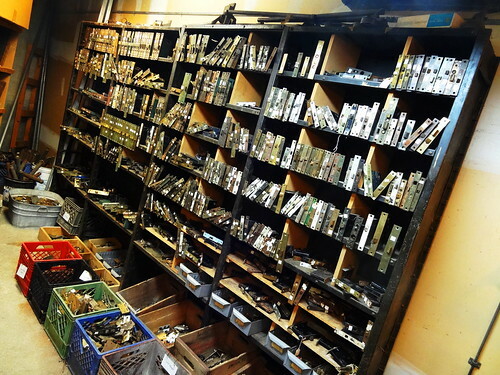 Over on West Michigan Ave we’re going to look at some more old stuff at Materials Unlimited, an architectural salvage store. I could wander around this place for hours. 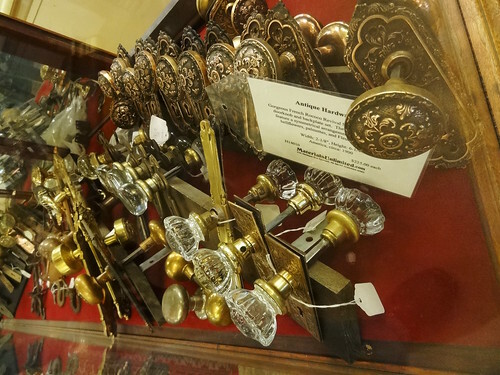 The selection of antique lighting is extraordinary; straight from mansions, ballrooms and historic homes, pieces run the gamut from humble to extravagant. 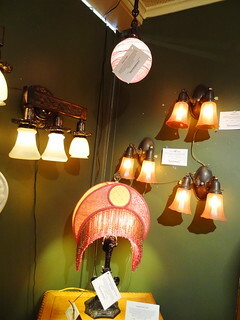 Candle wall sconces, ceiling fixtures powered by gas or electricity and table lamps that range in style from Neoclassical, Victorian, French, Colonial Revival to Louis XVI. 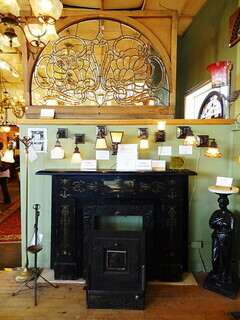 Materials are antique brass, wrought iron and cut crystal. I’m a fan of colored glass; blue opal, cranberry, rose and amber are just some of my favorites. Everything in the store is beautiful! Items are neatly arranged and organized; individual pieces wear tags listing the origin, era and in some cases where it came out of, I stop and read every tag on the pieces I like the most. 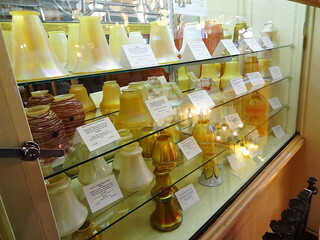 Glass shades are neatly arranged on shelves, brass door knobs and back plates are lined up in rows. 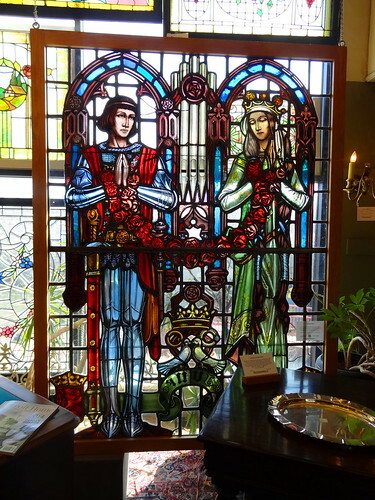 Stained glass is displayed in the large front windows, one piece by Karl J Mueller has a price tag of $24,750.00. 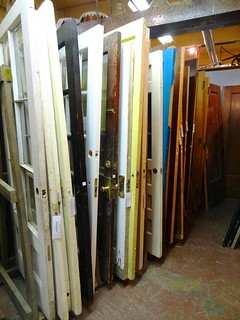 Crates of hardware seem endless; bronze mail slots, ice box hinges, pulls, knobs and door knockers can all be found here. Dining room sets feature enormously long tables, crystal wine glasses and decanters are lovely. Some areas are set up as vignettes; fireplace mantels and surrounds are decorated with andirons, chenets and beveled mirrors. Bathroom furnishings such as sinks and toilets are available in an array of colors, doors and windows come in every shape and size. 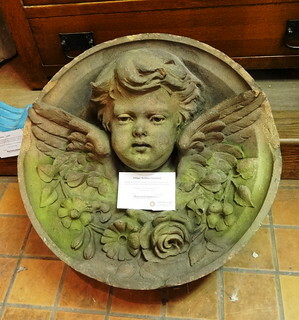 Standing, neck craned, reading a tag, Kris comes and finds me to show me a piece he knows I’ll love, a black and white, Italian marble, double sink and vanity that belonged to the Fisher family. 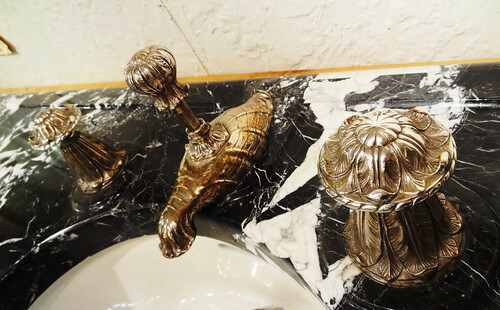 The marble is exotic, the faucet and spigot, a work of art. It was purchased for their home in Palmer Woods, they took it when they moved out and now it’s here for sale in Ypsi, check out the photo. All this browsing has made us hungry, just up the street we stop in at Dalat for a late lunch. 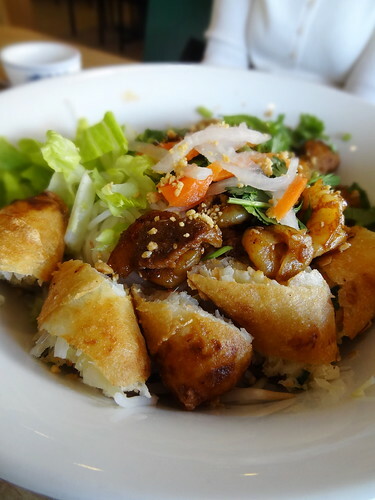 Both of us like Vietnamese food, but are not necessarily big fans of Pho; the menu here is HUGE, so much more to offer than a big bowl of soup. Our server greeted us quickly with menus and asks us what we want to drink; she returns with a pot of tea, answers our questions and takes our lunch order. We start with a fresh roll served with a tasty peanut sauce. A short while later our entrée’s arrive, since I’m not fluent in Vietnamese I can’t tell you the exact name of the dishes we had, but, what I can tell you is the food was delightful, fresh and tasty. A noodle dish; chopped romaine lettuce, chunks of egg roll, tender strips of seasoned beef and shrimp over steamed noodles. 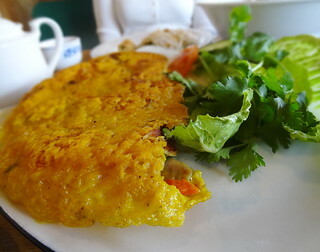 The other was a large, crispy crepe of sorts, yellow in color it was stuffed with shrimp, chicken and stir-fried vegetables. Portions are big but prices are not, each entrée was about $7. We drive around the city a little bit before heading home, Ypsi is loaded with beautiful architecture, there’s a quirky charm about Michigan Avenue, parts of it look like time has stood still—-I like that. Cities are like people, no two are exactly the same, each has its own personality and that’s what makes exploring them so much fun. 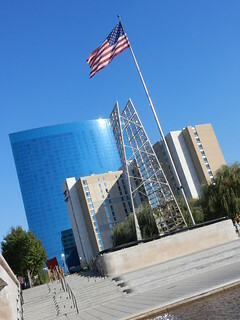 Our first morning in town we headed directly to the Indiana State Museum located in the White River State Park downtown. 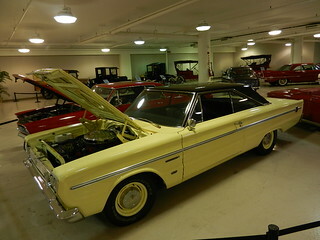 They have underground parking and the museum validates, so it’s the perfect place to park for a museum visit and a day of local sightseeing. 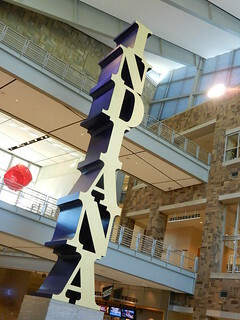 Constructed completely from Indiana materials the expansive museum is 3 floors of art, science, history and culture, telling the Indiana story. I always enjoy these types of museums because they really give a feel for the place and the people who live there; it’s fascinating to see the contributions they have made to the world. 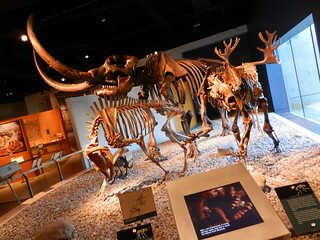 The museum is very 21st Century; the floor plan easily guides you from one large open gallery to another, beginning with the ice age and ending in the present day. 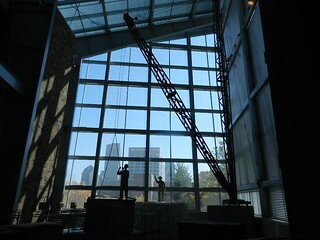 One of the most impressive exhibits is the mining of limestone; Indiana is famous for it! It is the highest quality quarried limestone in the US, therefore a popular choice for important buildings. 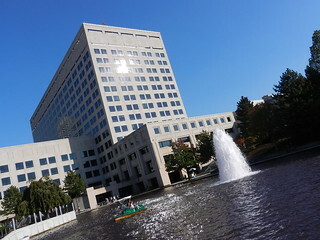 Here are just a few of the buildings made from it: The Empire State Building, The Pentagon, Biltmore Estate, and many buildings on the north side of Michigan State University campus. 35 of the 50 state capitol buildings are also constructed from Indiana limestone, quite impressive. When we were finished looking around we decided to have lunch right there at the museum, they have 2 restaurants on site. 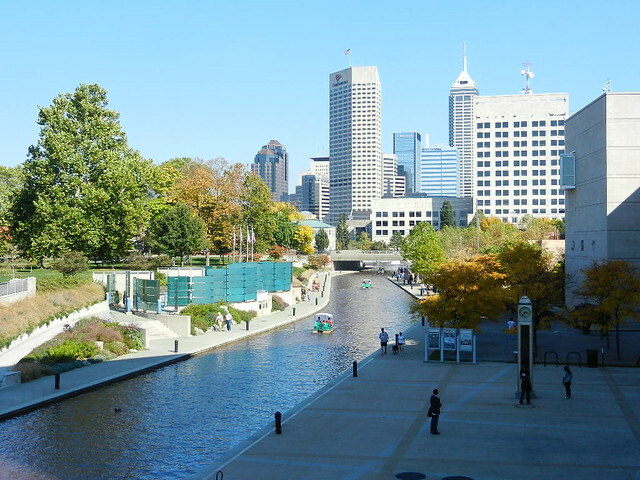 The temperature was in the mid 80’s and the sun was blazing in the cloudless blue sky, we ate our lunch on the restaurant patio with a beautiful view of Indianapolis. 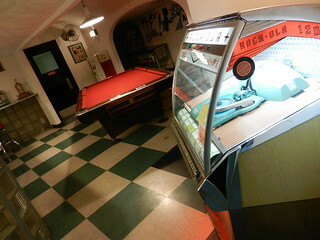 Stashed away in the Fountain Square Theatre Building are two vintage bowling alleys. Action Duckpin Bowl is hidden away on the 4th floor; this authentic 1930’s duckpin bowling alley features 8 lanes and a billiard table, it’s all original! You have to take the elevator up, once you step inside it’s like going back in time. We were looking to bowl a line or two, open bowling was on the lower level. 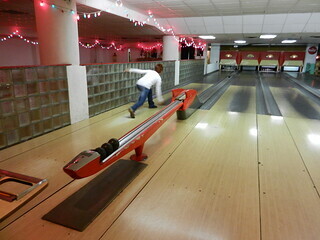 The Atomic Bowl Duckpin is straight out of the 50’s, with 7 duckpin lanes, a juke box and a pool table it’s neat-o. Also left just as it was, there is an extensive array of all things bowling in the 50’s; from trophy’s and team bowling shirts, to the light fixtures and vending machines, as if you have passed through a time warp. We lucked out, there was an open lane; we picked up our score sheet and those ultra attractive bowling shoes from the counter and we were ready. 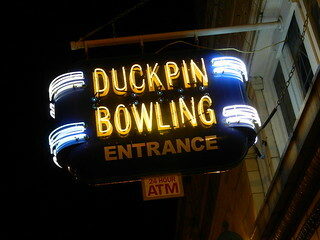 If you have never bowled duckpin, be aware,it’s a bit more of a challenge then regular bowling. Both the pins and the ball are smaller; in fact the ball is so small it does not have finger holes. You just sort of rest it in your hand and throw. Because of the difficulty you get three balls per frame, and believe me, you need every single one. It’s a lot of fun, especially if you don’t mind throwing gutter balls! If you like going back in time and experiencing something completely different, you’ll love this place. 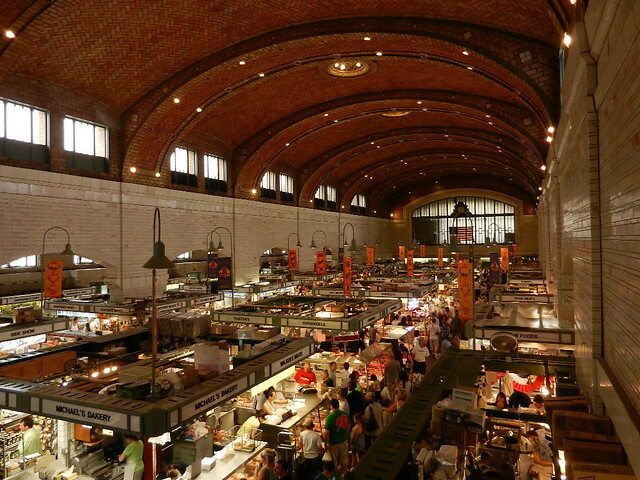 It had been too long since our last visit to Cleveland; Saturday morning I could hardly wait to head over to West Side Market. 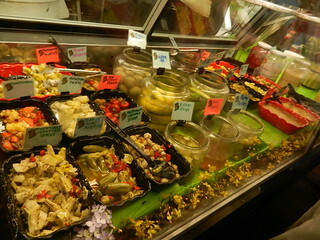 While Detroit’s Eastern Market is spectacular, Cleveland’s is the best indoor market in the Midwest, hands down . The extraordinary yellow brick market-house was dedicated in 1912 and is a feast for the eyes and the appetite. With 180 indoor and outdoor stands there is something for everybody. Traverse the aisles of artisan breads, cheeses, applewood smoked meat and spices; grab yourself a crepe and a cup of French roast coffee. How about a piece of Guiness Stout Chocolate cake? Enough cookies, cannoli, cheesecake and brownies to satisfy any sweet tooth. From tamales to hummus to perogi and fresh fish, they’ve got it all. 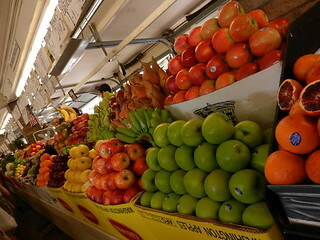 Rows of brightly colored fruits and vegetables line the adjacent corridors, samples of cantaloupe, mango, and watermelon are plentiful. The market was jammed with people picking up things for their weekend Bbq’s, others seemed to be there to just take it all in with their camera, we came just for the pleasure of it. Off we go to the East side of the city. 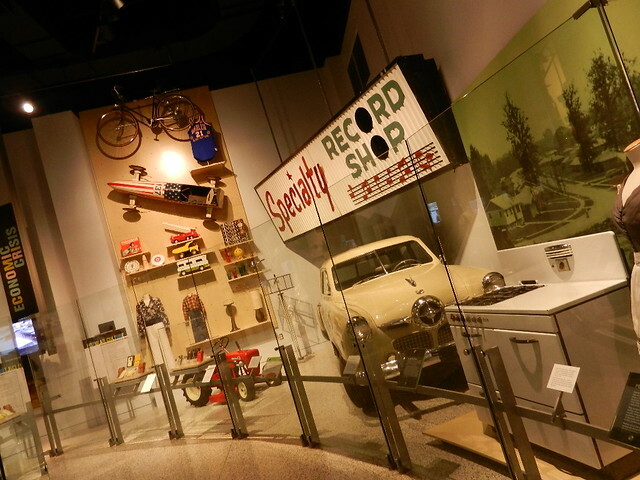 Most of you have heard of Cleveland’s Rock & Roll Hall of Fame, but you may not know of an area called University Circle. This is Cleveland’s Cultural district, the Art, Natural History and Auto Avaition Museums are all within it’s boundaries; So too is Wade Oval, the Botanical Gardens and Severance Hall. Even the symphony plays here ! 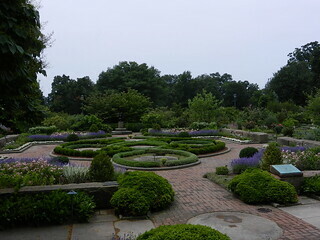 Today we’ll take you to the Cleveland Botanical Gardens. By now you’re starting to wonder if we ever do anything but go to markets and gardens, the answer of course is yes! This time of year a Michigander has to soak up as much of the bounty of summertime as possible. Come January we’ll all be wishing for days like this! A world of beauty awaits you in the 18,000 sq ft conservatory; you can trek across continents from the desert to the lush rain forest with 50 varieties of butterflies. 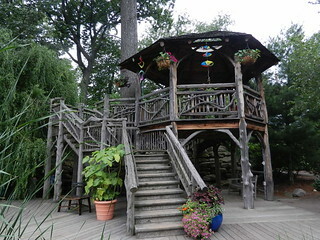 Climb the stairs to the lookout and get a birds eye view of the canopy. Tiny brightly colored birds stand out among plants as they eat, drawing attention from visitors. Journey outdoors to one of the many themed gardens, the Rose Garden shows off 50 varieties of Roses or take time for a little respite in the Japanese Garden. 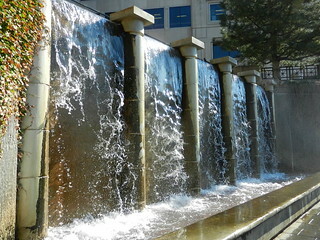 Fountains and waterfalls add a sense of serenity, find a secluded spot to sit and take it all in. The Hydrangeas were in full bloom, branches sagging with the weight of large pink and periwinkle flowers, tall Astilbe with their fluffy plumes reach toward the blue sky. 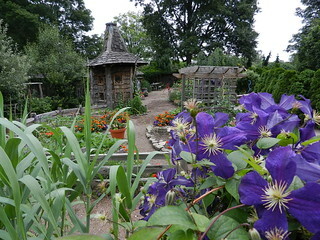 Kids will love playing in the Children’s Garden; there’s a playhouse with a garden on the roof, brightly colored flowers in beds have name tags that teach you what they are, and garden tools invite youngsters to dig in. 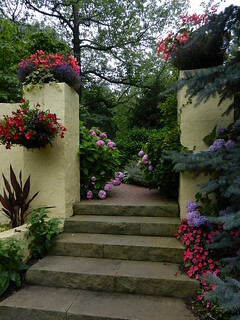 Of all the conservatories we visit, I think Cleveland has the best outdoor gardens, they are absolutely breath taking. 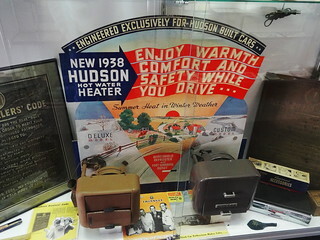 The Crawford Auto Aviation Museum is just a short walk from CBG and was our next stop. 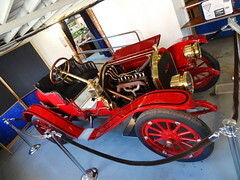 The museum is home to a great many cars, both elegant and cool, old and really old. 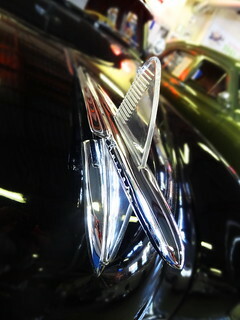 Large spoke wheels and tons of chrome remind you of days gone by. 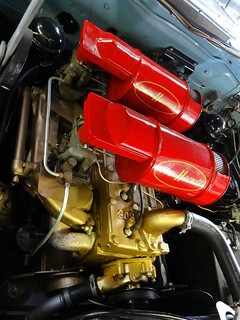 Nothing quite defines an era like an automobile; the earliest of cars resembled carriages, fins and chrome of the 50’s, bright colors and stripes of the 70’s, there’s a little of everything here, and Kris likes it all. 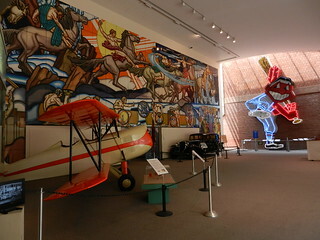 There are planes and a personal helicopter to see, the lower floor features and old fashioned street scene from Cleveland’s past; Large historic photos of the city hang on the wall with autos from the appropriate year parked alongside.Carousel horses are scattered here and there and add a touch of whimsy. Just inside the main entry doors is a giant neon Cleveland Indian mounted on the wall; it seems to be a favorite spot to take photos, well, unless you are a Tiger fan! The historic Bingham-Hanna house is also part of the museum complex and can be reached through the CAAM. 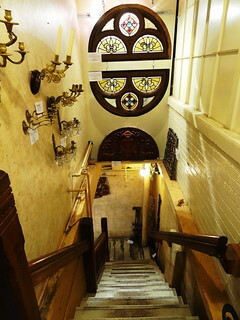 Now serving as part of the History Museum you can tour the main level and check out the elaborate decor and architecture, it is included in the admission price. There are changing exhibits; currently a display of vintage flags is available for your viewing pleasure.The Crawford Museum is about to undergo a major renovation, several areas were closed when we were there, so please check the progress before visiting. 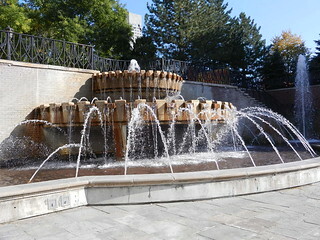 Little Italy is just a hop from University Circle, and is where we wanted to have lunch. Outdoor eating is a priority here and is offered at most establishments, but the heat drove us inside for lunch. We have eaten at several different cafes, we return most often toTratorria on the Hill on Mayfield. Big menu, big portions, everything is delicious here! 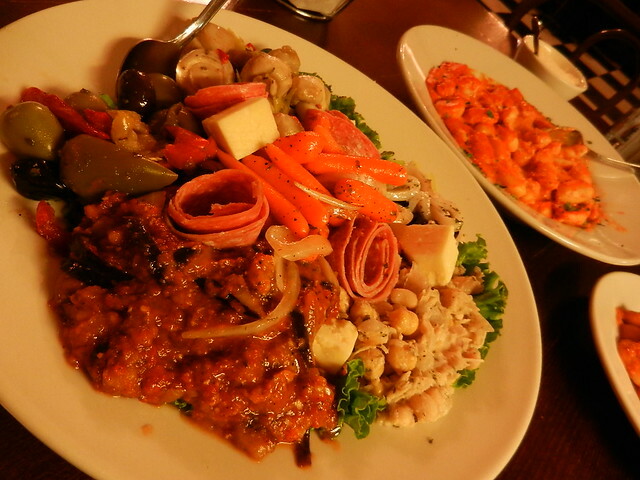 We ordered the Antipasto Platter, Oh My……mounds of roasted eggplant, strips of red peppers, calamari salad, olives and Italian cheese. Then there was the Gnocchi Al Burro, delicate potato dumplings smothered in a creamy red sauce, a house specialty, all so tasty. 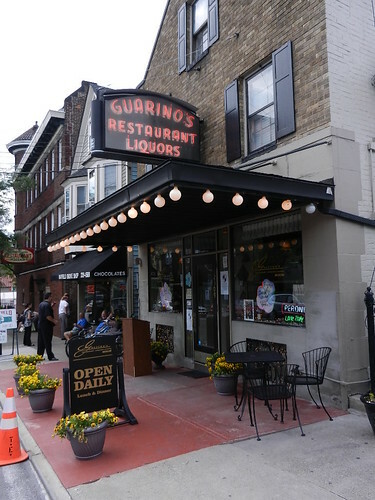 This charming enclave is the center of Italian culture in northeast Ohio, and one of our favorite areas, this is a must visit when in Cleveland. 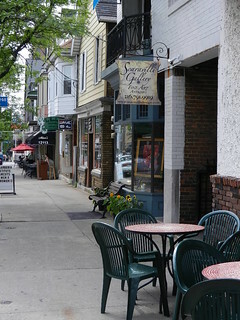 Mayfield and Murray Hill Roads are the main hubs of activity; Restaurants, shops, galleries and merchants line the two lane streets; Parking can be a chore, but it’s well worth the effort. Now we needed to walk off at least some of the bread we ate, Little Italy is the perfect place for a stroll. We wandered in and out of shops and galleries, grateful for the air conditioning each time we entered. 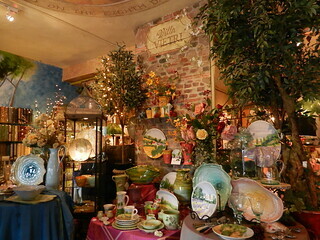 The selection of goods in this area is fantastic, whether it’s handmade art, wine or imported ceramics from Italy, I always bring something home. Back to the Bed & Breakfast to relax for bit before heading to Tremont for dinner and a nightcap. Tremont is a bit of a hidden hot spot south of downtown. Located in a somewhat elevated area of the city, there are some great views of the metropolitan area. This neighborhood is home to many incredible restaurants, bars, and galleries; usually a little more on the high end side. The warm evening put us in the mood for something cold to eat; Parallax is known for their seafood and fish dishes, and exceptional Sushi. We were happy to be seated right away as we were hungry. 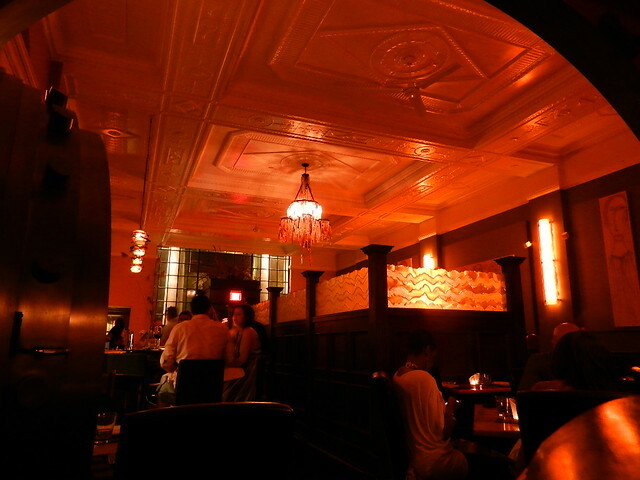 The interior is modern decor with high ceilings and exposed brick walls, very nice. Candles flicker on wooden tables, you may need the assistance of candlelight to read the menu as the lighting is dim; our server was friendly and helpful. 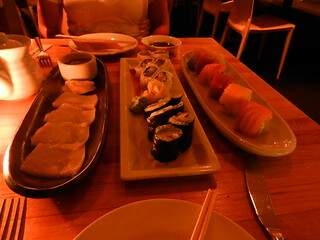 After perusing the menu we made our Sushi selections and waited for the food to arrive. 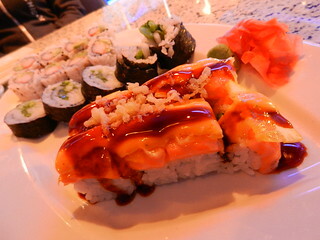 Everything was delicious, great flavor combinations, the Sushi was fresh and had that soft texture. We had heard a lot of good things about this restaurant and it lived up to its reputation. The last stop for the evening was Dante, also in Tremont. 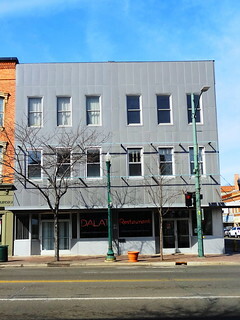 The outside of the building is intriguing, originally a bank it has been restored and converted to Chef Dante Boccuzzi’s signature restaurant. 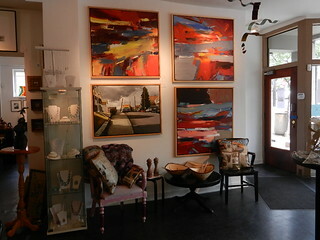 The interior features designs and art by local artists, bright orange walls contrast nicely with the dark wood, fabulous lighting extends down from the recessed decorative ceiling. There are tables and bar seating, but we got the best seats in the house; the safe! 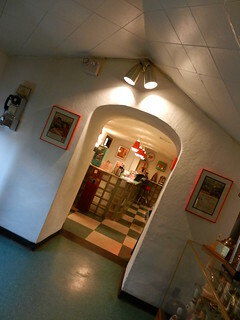 Yep, the safe door is permanently open and a single table sits in the middle, it’s a great space! They had $10 martini’s that night, so we each ordered a different one ; Kris had a White Chocolate and I had a Cosmopolitan, both were very good, so good in fact Kris had another one, this time a Chocolate Martini. 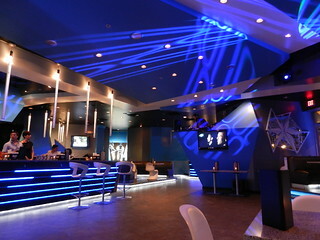 It was really nice to just kick back and relax, and enjoy our drinks in such an unusual setting. Our waiter was great too, in fact he gets to Detroit frequently so we had a nice conversation with him. 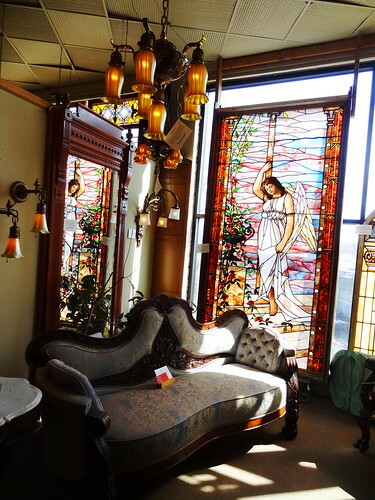 It seems there is always something new in Tremont and we continually enjoy our visits.